I used to have lukewarm feelings for mayo-based coleslaws, but once I made slaw with a vinaigrette dressing, I enjoyed it so much more. Coleslaw gets a bad rap. It is often presented in ways that are unappealing, slopped down as an unwanted side dish with ribs, burgers, or fish and chips. No matter how good it tastes, it’s always overshadowed by other elements on the dish, and perhaps rightly so…until now. I’m bringing slaw back – and you won’t be satisfied with just that tiny plastic cup. 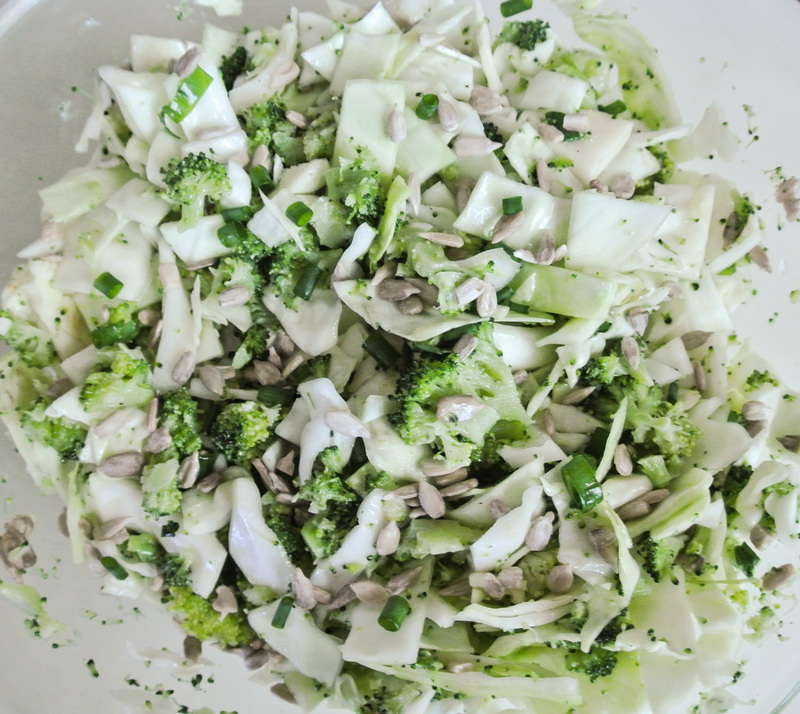 While slaws are traditionally made with cabbage as the main ingredient, you can certainly use any hearty leaf that will hold up to being dressed and transported to a backyard barbeque. Today, I’m starting with the basics. 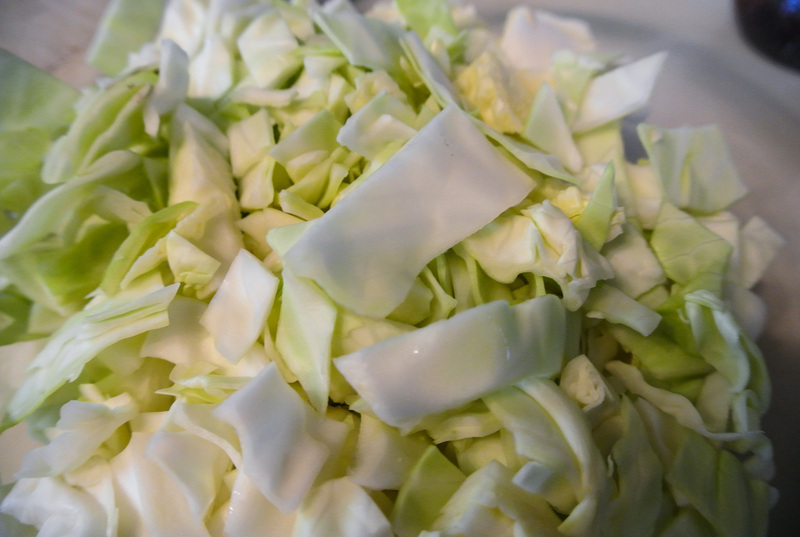 Cabbage is high in vitamin K and anthocyanins, which aid mental function and concentration. It is also a rich source of vitamin C and sulfur, which helps the body to remove toxins and improve skin. Cabbage has number of other health benefits and can even assist in getting rid of that nasty hangover! 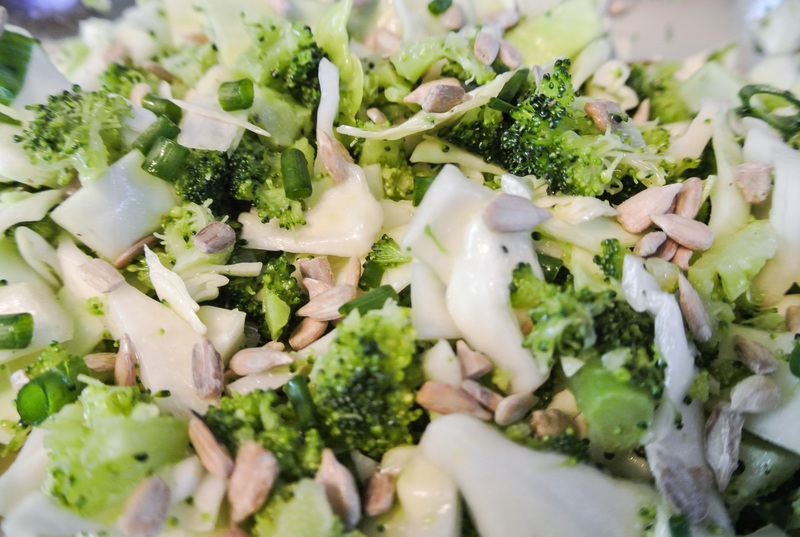 Another super food that I’m using in today’s slaw rendition is broccoli, which is in the same family as cabbage. Thus, it also a powerhouse of vitamins K and C and contains detoxifying properties. Finally, in my dressing, I’m using, for lack of a better description, a watered-down version of agave syrup. Thankfully, this sweetener is all-natural, containing small amounts of juices from other fruits that amount to fewer calories. Again, I don’t count calories, but what appeals to me about this sweetener over pure agave syrup is that it has a lighter, more refreshing quality about it, which I think pairs perfectly with a slaw like this one. 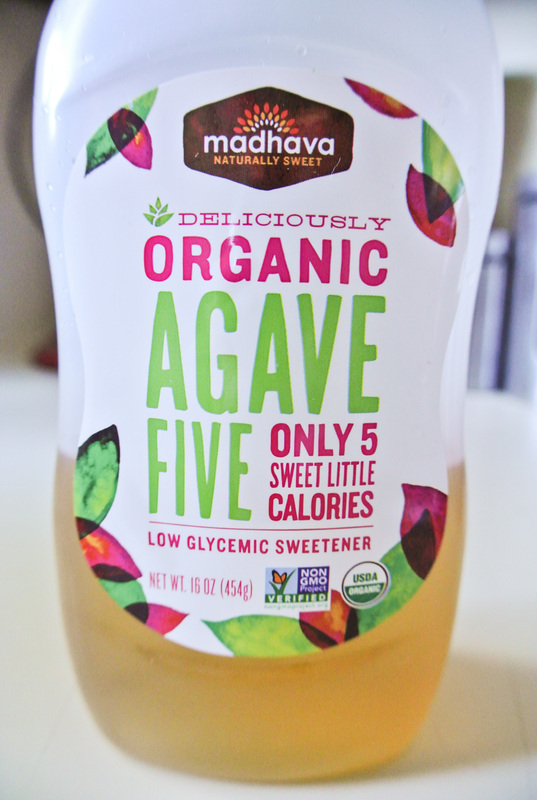 As you’ve seen in my other formulas, I use full-fledged agave syrup all the time, but I like this one best in this application. So, I beseech you to consider giving coleslaw another chance. My formula yields a crunchy, crisp dish that I would eat as more than a measly side. If I’m hungry enough, I’ll eat at least half of the bowl myself. 🙂 Enjoy! ½ head or 1 bunch hearty leaves (cabbage, kale, collard greens, rainbow chard, etc.) –> I’m using green cabbage. 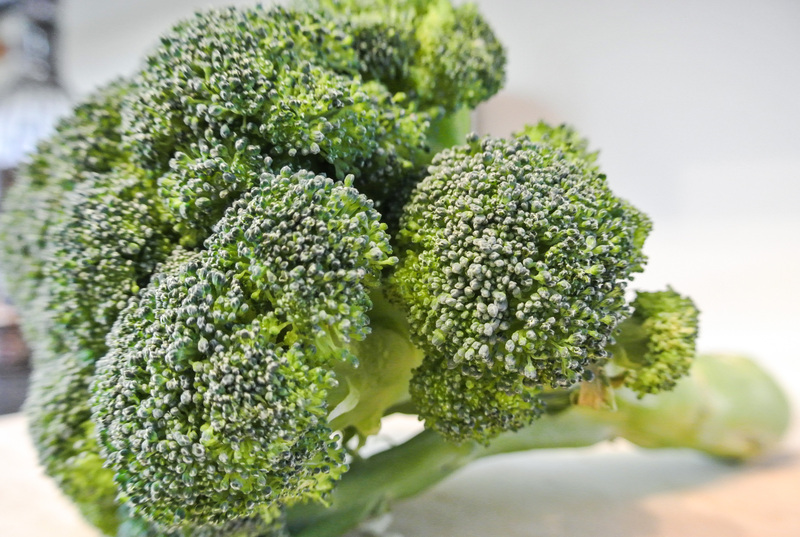 2 cups chopped raw fruit and/or vegetables –> I’m using broccoli. ¼ cup “crunch” (raw seeds, nuts, etc.) –> I’m using sunflower seeds. ¼ garnish (green onions, chives, fresh herbs, etc.) –> I’m using green onions. *Today, I’m using a combination of 2.5 tbsps white wine vinegar, 1 tbsp olive oil, 1 tbsp agave syrup, and salt and pepper to taste. Chop or shred your leaves; it isn’t important that they are perfectly uniform in size or shape. 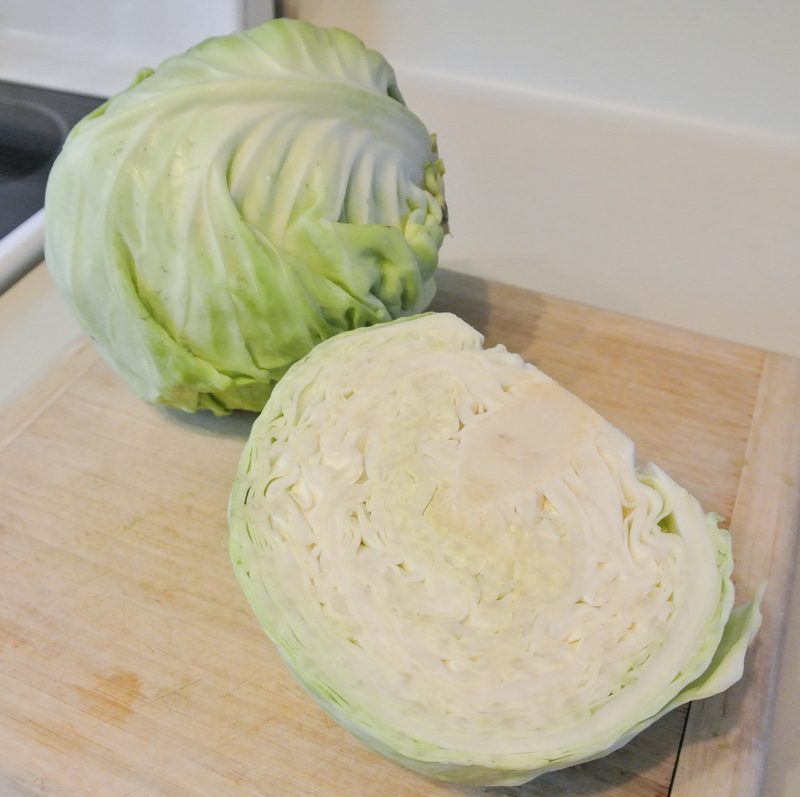 If you’re using cabbage—or a vegetable like it—cut around or otherwise remove the tough core. If you’re using a green with ribs—such as a kale—cut around or otherwise remove those as well. Finely chop your vegetables, crunch, and garnish (if needed) and add to your slaw base. Mix your dressing separately and pour over the slaw. Toss and serve. Holds up well in the fridge for a few days. ← I’m Pregnant, and I want PB&J!